How to Extract attachments from emails in Gmail. Sometimes, you may need to extract all attachments from your Gmail emails and download them. Here is a new free Android App – Gmail Attachment Extractor that makes this possible. 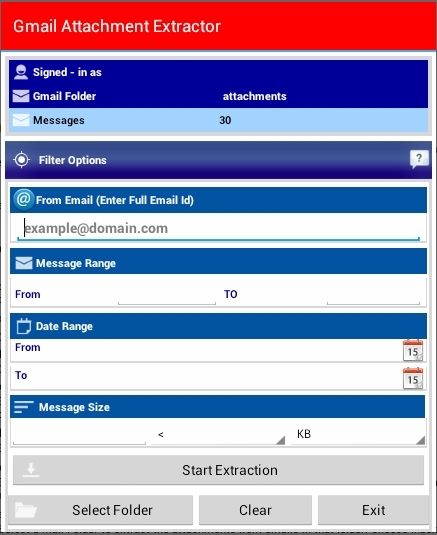 Download Gmail Attachment Extractor from Google Play store. Click on “Sign-on with Google” button. If you have multiple gmail accounts configured in your android phone or tab, then you will be prompted to select the account from which you need to extract the attachments. Otherwise, default Gmail account will be automatically selected and you will shown the list of labels/folders from your Gmail account. Select a folder from the list and wait for a few seconds. On the next screen you will be shown the total messages in the selected folder along with the filter options available to extract the attachments. Choose one of more options and tap the “Start Extraction” button to proceed. For example: To extract and download all attachments from a known Sender, just enter the Name or Email address of the sender (From email id) and hit the “Start Extraction” button. See the App’s help screen to know more about the options. Download Gmail Attachment Extractor now for free and download your Gmail attachments to your device. See Video tutorial on how to Extract Gmail email attachments. Get social shared count of your website, blog or any URL. Check the social popularity of a website/url in popular social networks. Available in two versions – on website and as Android App. Go to Social Share Count Checker Website to see it live. 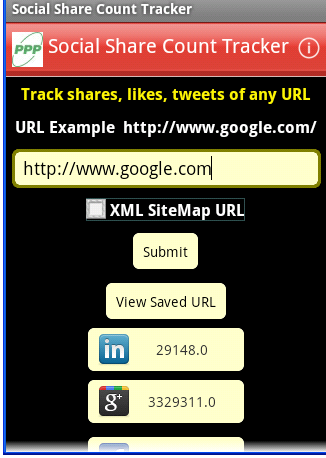 Check social shares, facebook likes, twitter tweets, google plus count of any URL. Shows shared count of Facebook (likes, shares, comments), Google (+1s), Twitter (tweets), Linkedin (shares), StumbleUpon, Delicious (bookmarks), Pinterest (pins). Open Social Share Count Tracker app from your mobile browser’s share icon to see the shared count of the url you are browsing. Know the social reach of a website or blog. file,click on Continue button to view the social shares of each URL. re-type the URL the next time. Just pickup the URL from the list and submit. Go to Social Share Count Checker Website now to see it in action. for advanced options mentioned above. 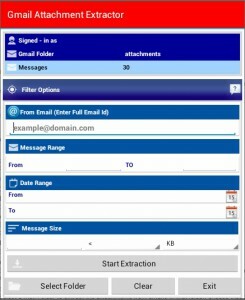 Email Extractor for Gmail – Visit www.gmailextractor.com to extract all email addresses from your Gmail inbox and other mail folders. Download extracted emails as .CSV file. Extract Name and Email address of senders of all mails in your Gmail. No software required, No giving away your password. Visit www.gmailextractor.com to Extract email address from gmail from Gmail inbox and any mail folders in your Gmail account. jointly presents Tamil Archakar course. Koyil poosai, kuda muzhakku etc in tamil. Twenty personalities honoured with Title for their contribution to Muthamizh and Saivam. Teaching Thirukkural to prisioners in Puzhal Jail, Research on Tamizh isai, Discovering Tamil Culture by ocean travel, Publishing rare tamil books, are noteworthy works done by awardees. We have heard about Nayanmars – followers of Lord Siva. Similarly there are many followers of Lord Muruga. Like Periyapuranam where the history of Nayanmars are known to the world by Dheivapulavar Sekkizhar, the history of the followers of Lord Muruga (Murugan adiyargal) is written as Sey Thondar Puranam. This is composed by Thenur Varakavi Chokkalinga pillai on request of Thanigamani Chengalvaraya Pillai. Like Panniru thirumurai – Murugavel panniru thirumurai is getting released. This book is getting released on 19th Nov. 2011 at Chidhambara Mahal, Mela Chinthamani, Trichy under the august presence of Arulmigu Rathinagiri Swamigal and other Murugan aatheenams. An explanatory article about Sey Thondar Puranam is published as episode in dheivamurasu monthly tamil spritual magazine. TRAI has allowed mobile subscribers in India to send upto 200 SMS per day per SIM. Earlier, the limit was 100 SMS and after representations from many people this limit has now been increased to 200 SMS per day. Post-paid subscribers can send upto 6000 SMS per month per SIM. With effect from September 27th, 2011, promotional unsolicited SMS should not be sent to mobile numbers which are listed in “National Customer Preference Register” NCPR. Telephone customers (landline and mobile) can register their telephone numbers with their telecom service provider for inclusion in the National Consumer Preference Register (NCPR) by dialing or sending sms to toll-free number 1909. Here are some of the highlights of the regulations by TRAI to curb Unsolicited Commercial Communications (UCC) to landline and mobile users. Telemarketer should not make telemarketing voice call or send SMS – between 9 PM and 9 AM to any phone user irrespective of the fact that such subscriber is registered on NCPR or not. Mobile subscribers who are sending bulk SMS (categorized as “unregistered telemarketers”) will not be permitted to send more than 100 SMS per day per SIM except on blackout days or days specially notified by TRAI. Hereafter, none of the mobile users will be able to send more than 100 SMS per day per SIM. But as per regulations, special permission can be obtained by anyone from the mobile service provider to relax this limit. All registered Telemarketers have been allocated 10 digit number of “140” number series. Therefore, you can identify the telemarketing calls even if you are not registered with NCPR. You might receive a telemarketing call starting with +91140 on your mobile or 0140 in your landline phone. If he/she chose option “4. Health” he/she will receive telemarketing calls and bulk SMS related to Health. This choice can be modified any time by calling or sending SMS to 1909. Promotional SMS can be identified by special alpha numeric sender IDs. Telemarketers will be allotted a special code by the mobile service provider. Mobile users can identify promotional SMS just by looking at the SMS SenderID. We all celebrate Independence Day every AUGUST 15th, this August 15, 2011 is 65th year of Independence. But only few of us know that AUGUST 15th 1995 was the date of birth of Internet in India. And this year we celebrate the 16th birthday of INTERNET in India. PPP group salutes our national flag and also mourns the death of veteran actor Mr.Shammi Kapoor, the founder and Chairman of IUCI (Internet Users Community of India). A veteran flim actor who had a vision and mission of Internet in India. IUCI was instrumental in spreading the usage of Internet in India. As on May 31, 2011, there are 840 million (84 crores) mobile subscribers in India. Fixed line subscribers are 34.40 million (34 crores) in India. This data was released by Telecom Regulatory Authority of India (TRAI) recently.